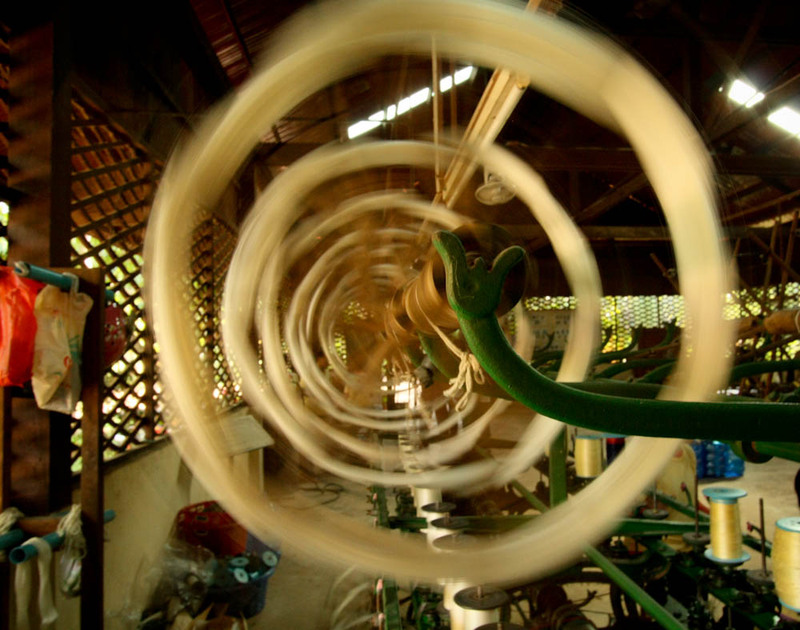 There are two parts to Artisans d'Angkor. There's a workshop in downtown Siem Reap where they learn wood and stone carving, silk painting, and metal working. There's also a silk farm outside of town where they learn to raise silk worms and weave fabrics. We started our day in town at the workshop. After lunch we caught a free shuttle out to the silk farm to see where...silk comes from. 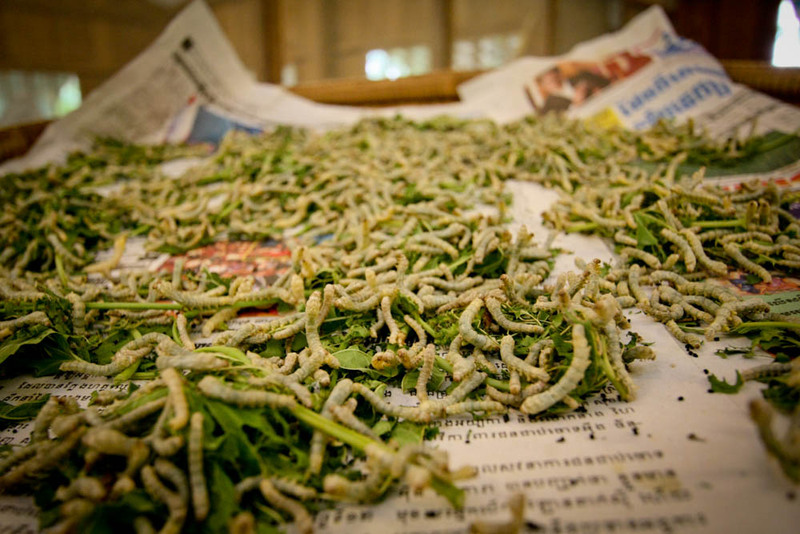 Silk worms only eat mulberry leaves. Really, that's the only thing that they eat their entire lives. Just seems a little wierd to me. So they grow their own mulberry trees at the silk farm to feed all the worms. They have mulberry trees from China, Japan, Thailand and India on display, but the fields are full of Cambodian mulberry trees. They are very proud of their trees here as they are the only mulberry trees in the world that produce a golden colored silk when eaten by the silk worms. Interestingly though, they have to bleach the golden color out so that the silk will take the dyes. The worms have a pretty good life at the farm, where they basically get to eat all day as much as they want, sleep out of site of nasty birds who love to eat them, and then...mate, when it's time for some baby silk worms. For all the great life they have at the farm, only about twenty percent of the worms are allowed to exit their cocoons to become moths. The other eighty percent have to be killed because there's no way to get the worm out of their cocoon alive without ruining the thread of silk. The worms spin the cocoon in one long strand that has to be unwound by hand. They boil them in a pot and use a fine tined fork to tease the strands out. They then role it onto a wheel and send it down the line. The worms of course come out cooked and people here love to munch on them. They let us taste one and it was suprisingly good. It tasted like corn. 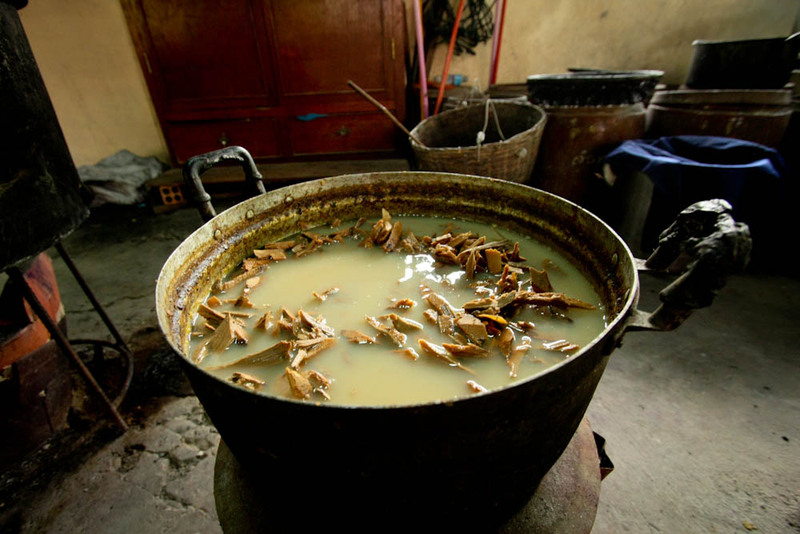 All of the dyes they use here are natural, made from different plants native to the area. To create the designs in the fabric, they make bundles of thread and then basically tye dye them by wrapping little pieces of plastic around them and putting them through various layers of dyes. 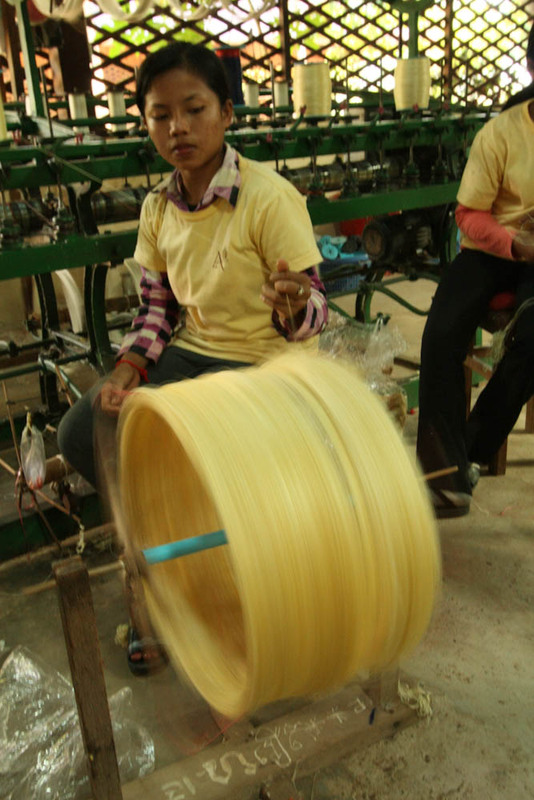 Then they roll the dyed threads onto these sticks which go to the weavers. As they weave, they line up the dyed sections just right to create the pattern in the cloth. If they get anything out of order or in the wrong place, the whole pattern gets screwed up. It was really cool to see how the whole process worked and I'm just amazed that people ever figured out how to get a piece of silk from a worm cocoon.